Today we bring you a longer video blog about a very special woman and her family. Many of you know of the extremely talented Baldwin family, or shall I say all the Baldwin men, but did you know that all those brothers are supported and loved by their sister Elizabeth (Beth) Baldwin? We first met Beth five years ago when she started ordering Pink Carts for various fund raising activities in New York state. The family co-operatively support the Carol M. Baldwin Breast Cancer Research Fund in honor of their Mother, a breast cancer survivor. Carol serves as Chairwoman of the Board and, as a breast cancer survivor, she uses her experience to heighten understanding of the disease. The Fund's work is all around prevention, education, and raising money for breast cancer research at Upstate Medical University in Syracuse, New York. Beth is a tireless individual who, for over 15 years, has dedicated herself to the search for a cure. Not only does she orchestrate raising a lot of money, but in a very personal and daily way, she cares for and provides emotional support for these individuals and their families who have been stricken with the disease. She is, quite frankly, a remarkable woman and we feel very blessed to have gotten to know her and work with her most recently at The Great New York State Fair in Syracuse, New York from August 22 – September 3, 2018. 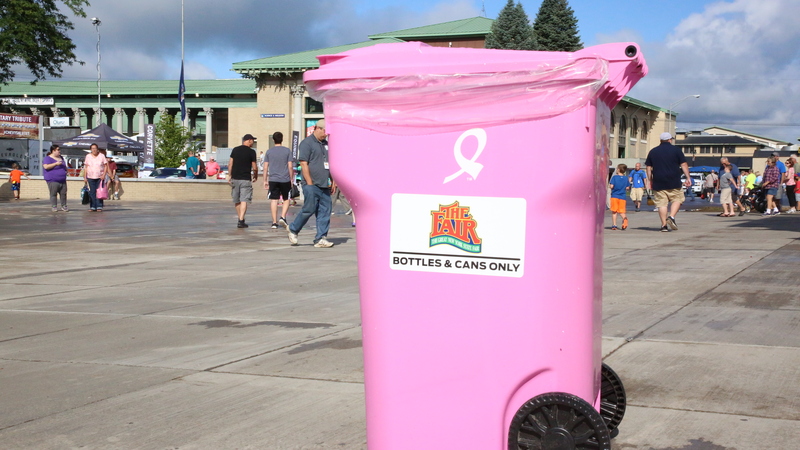 There they had a large pink booth and partnership with Laurence Segal’s Cans for Cancer, where they placed over five hundred beautiful Pink Carts all over the fair grounds for the collection of cans and bottles. You see, New York is a Bottle Bill State, which means you pay a deposit when you buy a beverage and then have that deposit refunded when you return the container. In NY that deposit is $0.05 per container, which once redeemed can really add up. Beth, Laurence, and many hundreds of volunteers collected many thousands of beverage containers over the course of the thirteen day State Fair and in partnership with local redemption center Tomra Recycling Network, who offered them $0.06 per container, they raised many thousands of dollars for the Carol M. Baldwin Breast Cancer Research Fund. We travelled to the Fair, my first time ever, and interviewed Beth on her booth which was a busy going concern! You will enjoy meeting her, as she is a great public speaker and deeply passionate woman very focused on the task of wiping out breast cancer in her lifetime. Hats off to Beth, and all the tireless people like her, quietly (or in her brothers' case not so quietly) working behind the scenes.